Happy Sunday everyone! Today we are jump out of our seats excited to have the supremely talented children’s book author Julia M. O’Brien-Merrill join us on the podcast. It was so exciting and interesting to hear all about her first children’s book, Charlie on the M.T.A., Did He Ever Return? This delightful children’s book is the story of a much-loved song, a great American city, and some fascinating history of both. In this episode, we also find out about the history of the MTA along with Walter O’Brien’s run for mayor, the family’s move to Maine and the writing of this story, hear lots of funny stories along the way. Join us on this episode to find out more about Julia and learn about her book that talks about the fascinating history of a famous song Charlie on the M.T.A.! A lifelong educator and daughter of a librarian and a reading teacher, Julia M. O’Brien-Merrill has firsthand knowledge of the power of reading richly illustrated children’s books to teach about the world. She has had the good fortune to teach children in Maine, Pennsylvania, New Hampshire, New York, Tennessee, and China. Born in Boston, now living in Maine and retired from teaching English as a Second Language, she has time to play her violin, practice yoga, downhill ski, study Spanish, travel by land and by sea with her husband David, and visit with her westward-ho grown sons. 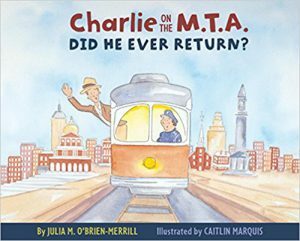 In her first book Charlie on the M.T.A., Did He Ever Return? she has fulfilled both her own and her father’s dream of honoring his commitment to social justice through a book that will teach future generations about a piece of Boston history. More about Charlie on the M.T.A. : Did He Ever Return? Do you know why the transit fare card in Boston is called the CharlieCard? Young readers will find out, and should bring an extra nickel along, when they hop aboard the “T” to follow Charlie through the streets of Boston in 1949. The full-page magical illustrations of Caitlin Marquis will take readers on a ride above and below the streets of Boston as they were in Charlie’s time, zooming past familiar landmarks―many still standing, some long gone―wondering all the while, will Charlie ever return? Julia M. O’Brien-Merrill sets the story straight using original historical documents and the original M.T.A. song lyrics of the mayoral campaign song, written by Bess Lomax Hawes and Jackie Steiner, for her father Walter A. O’Brien, Jr. A timeline at the end of the book has juicy tidbits of Boston’s history surrounding this time-honored folk song, made famous by the Kingston Trio, and will inform and enthrall readers young and old. With refreshing resources, such as this book, learning about the history of Boston will become such a breeze. Grab a copy today by clicking the Amazon link below! More about Charlie on the M.T.A., Did He Ever Return? 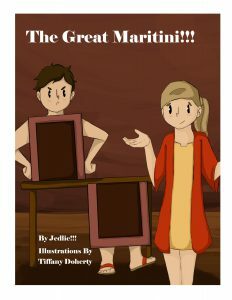 How did Julia become a children book’s author/illustrator? Her upcoming projects and some fascinating facts about her father Walter A. O’Brien, Jr. and Laura M. O’Brien and the history of Boston. Finally, where can you find Julia on the internet?